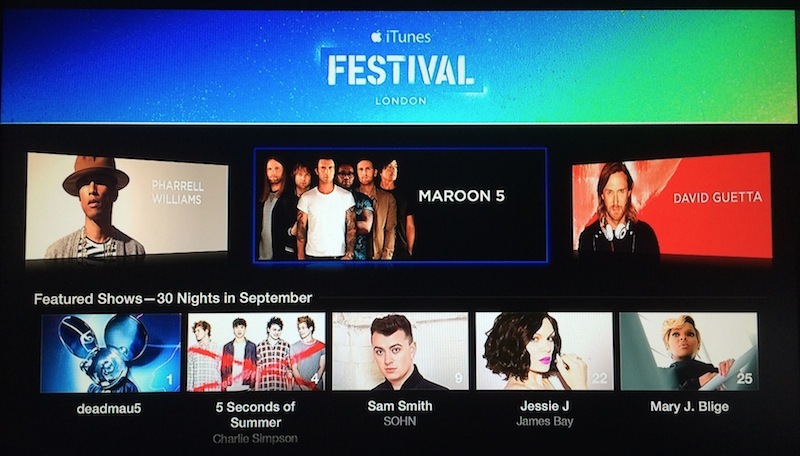 Apple today launched its iTunes Festival channel on the Apple TV ahead of the festival's start on September 1. Similar to previous years, the iTunes Festival channel contains information relevant to the upcoming London version of the popular music festival. Ahead of the event, the channel allows you to browse information on the history of the festival, details on the Roadhouse, and the performance schedule for next month. When the festival begins, Apple TV owners can watch HD streams of both live and archived performances. Apple recently filled its performance calendar adding well-known musicians such as Mary J. Blige and Tony Bennett to the festival lineup. These performers will join previously announced acts such as Maroon 5, Pharrell Williams and Lenny Kravitz. Tickets for the concert are available for free via a lottery system and through local radio station promotions. Apple's iTunes Festival iOS app is also showing as having an update available to support the upcoming concert series, but many users are reporting errors when trying to update their apps. Oxymoron: it's a "music festival" but oddly there's no actual festival. And no music worthy of note. Who cares! Let's pretend it's like it was when Dad was around. Enjoy the idea at least. Ironically it was the iPod that contributed to the death of non- singer songwriter dross. And now they're celebrating the fact. Those who enjoyed music when it was around (those over 35 years of age, for example) are advised to steer well clear. Well, there's not much left. All those great musicians are very expensive to get or are already dead.